Does your bathroom smell like chlorine while you are taking a shower? If you answered yes, then you should consider a shower water filter for your bathroom. Not only does chlorine smell unpleasant, it strips the essential oils from your skin leaving it itchy. You may also consider a shower filter if you have hard water since it is not kind to your skin and often makes it appear dry. 2.2 What Gets Filtered with a Shower Water Filter? We have reviewed our 12 favorite shower water filters and provided pros and cons of each one. There are some tips at the end on what you should consider when buying a shower water filter. This should help make your decision-making process easier. This AquaBliss product lets you take a shower under water that has been filtered to reduce the presence of harmful minerals and bacteria. This filter has a replaceable multi-stage filtration system guaranteed to purify your shower water and inhibit the growth of bacteria. Once you use this shower filter, you will immediately feel the difference in your skin and your hair. Not only will your hair appear thicker, your skin will no longer be dry and itchy from the harsh chemicals and minerals in the water. It will amaze you how different you feel after a week of taking showers with this filtration system! To filter the water, this product uses a proprietary mixture of active carbon, calcium sulfite and KDF-55 (kinetic degradation fluxion) which is a filtration media. The shower filter cartridge lasts for about 12,000 gallons of water and you should then replace the cartridge for optimal performance. 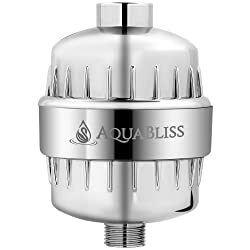 If you are tired of dry, itchy skin and the smell of chlorine and other chemicals in your shower water, then consider this AquaBliss SF100 shower filter. 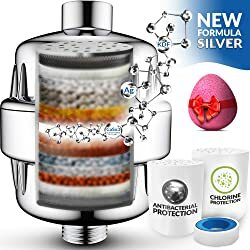 It features a 12-stage sediment filtration system which uses a proprietary mixture of KDF-55, calcium sulfate, activated carbon and ceramic balls to filter the water and neutralize odors. This shower filter removes chlorine, heavy metals, bacteria and inhibits the growth of algae and mold. It also restores your skin and hair to its natural state making you look and feel like a superstar! The AquaBliss SF100 is an “easy swap” showerhead filtration system that allows you to replace your filter without annoying tools. AquaBliss designed the fittings so this filter will work with all shower types. If you are looking for a solution for hard water to remove chemicals and minerals, then consider this AquaBliss SF100 product. It will leave your water feeling soft and will restore your skin and hair to its natural beauty. This shower filter features a 15-stage filtration system to reduce the presence of minerals and other harsh chemicals that are in your shower water. This filter is great for hard water and for well water since it can remove excess heavy metals from the water stream. The manufacturer recommends letting water run through the filter for 5-10 minutes before using it to remove any carbon dust build up. The filter should be replaced every six months or more frequently if you water has a lot of contaminants. This allows you to use one immediately and have the second cartridge on hand to replace later once the first filter stops working effectively. No more scrambling to place an order online or run to the store to get a replacement cartridge! Some shower filters will reduce the water pressure as it is filtering your shower water. This filtration system will keep your water pressure at a consistent level and is a great solution for purified shower water. This 15-stage shower filter will remove unpleasant smells and harsh minerals from your shower water. 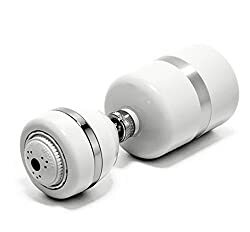 With this shower filter, you will get rid of your dry itchy skin and will experience soft, smooth, healthier looking skin. You will receive a total of two cartridges with this product. You can use the first cartridge on your shower head immediately and the second one is a spare to be used when it is time to replace the cartridge in about 6 months. Each cartridge will filter up to 10,000 gallons of water. This product will not reduce the water pressure in your shower during use. You can install the filter in any shower system that uses a ½-inch thread type, and it fits most shower heads. Choose this product if you need a shower filter to reduce the presence of harsh minerals in your shower water. This shower filter product includes its own integrated shower head with multiple massage settings. The AQ-4100 shower filtration system uses AquaSorb HX coconut shell carbon to reduce chlorine and synthetic chemicals. It also uses a copper and zinc blend KDF-55 process media to further reduce chlorine and to enhance the pH balance. This product delivers water that is gentle on your skin and hair. It reduces harsh minerals and chemicals from your shower water to leave you with moisturized skin and healthier hair. Replacement filters are a breeze to install and does not require you to remove the shower head. You can simply unscrew the filter cartridge and screw back on a new replacement cartridge. The cartridges last for 10,000 gallons of water or for 6 months. Aquasana offers a 1-year warranty on this product making it a risk-free choice in shower filters. This shower filter from Limia’s Care is a 10-stage filtration system. This system consists of of KDF-55, calcium sulfite, cotton and metal mesh, tourmaline balls, germanium and magnetic energy and ceramic balls. It works well at removing harsh chemicals from hard water. This in-line filter reduces the level of chlorine in your water, a lot of heavy metals and organic substances. It will revitalize your skin and will leave your hair feeling healthy as if you just stepped out of a salon. The filter installs in minutes and includes universal connections to work with all shower types. You must replace the cartridges every 5-6 months or after 12,000 gallons of water use. It comes with a spare filter cartridge so you do not have to rush around at the last minute to locate a replacement. 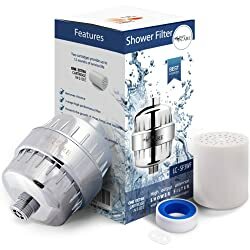 If you are searching for a shower filter to reduce the amount of chlorine in the water, this product is the right choice for you. You will not be disappointed in the results! This shower filter from Berkey reduces chlorine by up to 95%! The filter uses KDF-55 process media which reduces hydrogen sulfide, micro-organisms, and water-soluble heavy metals. It also kills bacteria and inhibits the growth of bacteria and mold. Although this shower filter does not include a shower head, it is very simple to install. It even includes a back flush attachment to prevent premature clogging. You should not use this shower filter with a shut-off valve, however. The Berkey shower filter typically lasts up to 1-year or 20,000 gallons, making this one of the higher performance filters on the market. 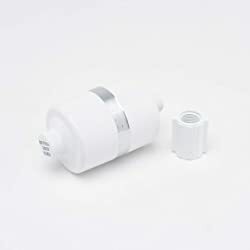 This product is a fully sealed shower filter, therefore it is not possible to replace the filter cartridge after it has reached its maximum usage. 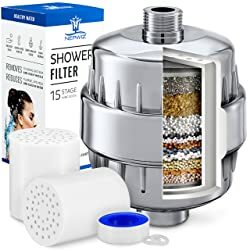 If you want a shower filter that will protect your hair and skin from the damage created by harsh minerals and chemicals, then this product is a great choice to consider. Its 15-stage filtration system uses KDF-55 process media to purify the shower water and eliminate chlorine, heavy metals and bacteria. The filter includes Vitamin C which is released in the water flow to nourish your skin with natural moisturizers. 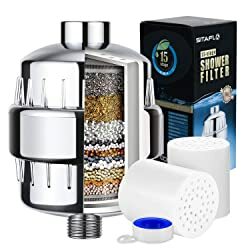 This product includes two filter cartridges, a chrome holder and everything else needed to install this shower filter. This filter is great for well water and hard water systems. It not only filters out the minerals from the water, but it reduces the strong odors that often accompany well water or city water. Once you use this filter, you will wonder how you lasted so long without it! For an easy to install shower filter, consider this 12-stage filter from Select Filters. 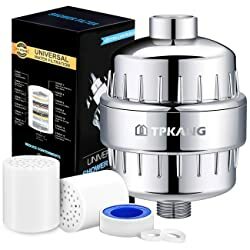 It does not require any tools to install and the universal connections with all types of showers and shower heads. The high output shower filter removes harmful chemicals that can damage your skin and hair. This filter uses a 12-stage filtration system to remove the impurities and harsh chemicals from your shower water. The 12-stage system uses a unique blend of KDF-55 process media, calcium sulfite, activated carbon, maifan stone balls and four kinds of ceramic ball purifiers. You can buy replacement filter cartridges that last up to 12,000 gallons. After using this filter system, you will be pleased to no longer have dry and itchy skin. Let this shower filter do the dirty work for you while you relax under the soft filtered water stream in your shower! 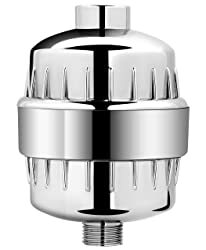 This multi-stage filtration shower filter uses a blend of active carbon, calcium sulfite, KDF-55 and silver ceramic balls. The silver helps to break down bacteria in the water. This is a high performance shower filter which makes sure you maintain a large water flow rate. It will reduce up to 97% of the chlorine in your water and get rid of the chlorine odor. This filter is compatible with all types of shower heads and standard faucets. There are two filter cartridges included so that one can be used now and the other can be used as a replacement later. This shower filter will process water at a rate of 2.5 gpm (gallons per minute). This is the same flow rate as most standard showers. The filter will last for up to 12,000 gallons of water. The manufacturer recommends you run water through the filter for the first 5-10 minutes to remove any existing carbon dust. This 15-stage shower filtration system uses enhanced KDF-55 process media to purify the water coming out of your shower. It eliminates chlorine, heavy metals, bacteria and so much more. It distributes Vitamin C as the water flows through the filter and into the shower head. This product comes with an additional filter cartridge so you have a backup once your water filter reaches its maximum usage. There is not decline in water pressure with this product. I like this product because it provides a 12-month money-back guarantee on this product. This is a great feature that will allow you to buy this shower filter with confidence knowing it is a risk-free choice. 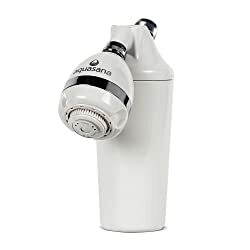 This Berkey shower filter comes with a massaging shower head with several settings. You can have a great hot water heat massage in your shower while you are getting filtered water that reduces chlorine up to 95%. This shower filter will last up to 20,000 gallons or 1-year. A back flush attachment is included to prevent premature clogging. If you live in an area where the chlorine concentration in your water is high, then this is the best shower filter for you to consider. You will like the results and the absence of a chlorine smell in your shower! When you are searching for a shower water filter, it is hard to know what options to consider. Here are some tips and tricks to help you with your decision. There are different types of shower filters for you to choose from. Consider which style will work the best for your bathroom configuration and the bathroom decor. In-line shower filters are popular because they allow you to continue to use your existing shower head. You install an in-line shower filter between the shower arm and the existing shower head. Some in-line shower filters are bulky, so you need to be sure that your existing shower installation will work with the added filter attachment. Shower head filters have a filtration system built in to the shower head itself essentially hiding the fact that you have a filter in your shower! These shower heads are often larger but will filter out harsh minerals while still providing good water pressure. In-line and shower head filters provide an integrated solution allowing you to connect the entire unit to your shower arm and water line. 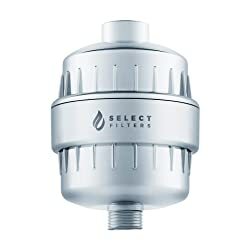 The in-line filter will filter out the contaminants from the water while the shower head will deliver good water pressure coming out of the filter. What Gets Filtered with a Shower Water Filter? When you are reviewing different shower filters, you need to consider what it is you are trying to resolve with a filter. There are some filters that will only reduce chlorine in your water. This makes it safer in your shower since you will not longer be breathing in the chlorine vapors. There are chemicals and minerals in water that will dry out your skin and leave it itchy. Some filters will reduce the presence of these harsh contaminants and leave your skin feeling soft and moisturized. If you have hard water, you may want to consider a water filter that is specifically designed to make the water soft. This will also leave your skin and hair feeling healthy. Multi-stage filtration systems are the most popular water filters on the market. These filters will push the water through various types of materials or mediums specifically designed to remove particular contaminants from the water. KDF water filters are typically combined with activated carbon along with copper and zinc to filter out specific contaminants from the water. The copper and zinc metals oppose each other creating a small electrical-chemical charge that affects elements and contaminants in the water which allows them to be filtered. Vitamin C filters not only remove chlorine but can also remove contaminants and other sediment from the water stream. Vitamin C filters can be stand-alone filters or may be combined with another type of filter. 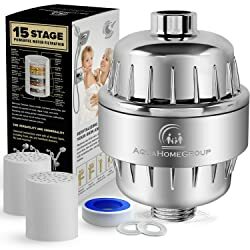 We have give you reviews of several products and guidelines for how to choose the best filter based on your needs. If you really want a quality shower water filter, consider one that has been rated a known reputable source such as the EPA (Environmental Protection Agency). These filters will have a higher quality standard than other non-rated brands.